Women love to beautify and enhance the natural features of their face. I too love to experiment and try different products and makeup shades on my eyes, lips, and face. Whenever I go shopping, I make sure not to miss the cosmetics area. I love to browse all the available cosmetic items and check out what I would try next. In one of my shopping escapades, I came across Fashion 21 stall and their eyeliner colors caught my eye. They have lots of eyeliner shades available, from white, to peach, to blue, to black, to green, and so on. I was curious what it would be like if I sport a blue eyeliner shade, so I picked it up. Its very cheap and affordable. This eyeliner cost me PHP 89 only. It's a dual end eyeliner with the smudger on the other end. 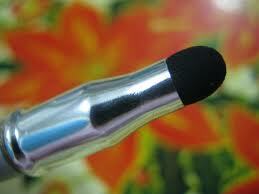 + Glide the eyeliner pencil close to your lash line. + Smudge the application to create a smokey effect. The first time I glide the of eyeliner on my upper eyelids close to my lash line, the result is almost invisible so I have to reapply it a lot of times to make it more visible. I also had a hard time applying it on my lower waterline because it seems like I'm not applying anything at all. 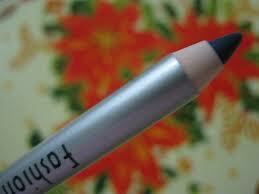 I don't recommend this eyeliner shade at all because of the results I got [please refer to the picture above]. The texture is a bit dry and I really find it hard to apply especially on my waterline. The product ended on trash because I honestly don't like it. Though its cheap but its a waste of money. I don't want to be biased though so before making a conclusion with this product I also want to try out the other shades and see if its the same.